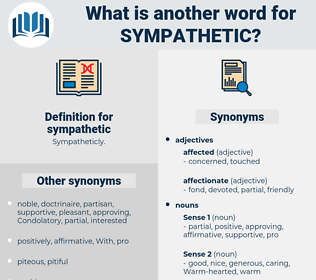 What is another word for sympathetic? likable, favourable, benevolent, positive, gracious, conducive, solidarity, favourably, favorable, Kind-hearted, solidarity-based, willing, accommodating, amenable, comprehensive, welcome, agreement, sweet, significant, beneficial, appreciable, cool, attractive. 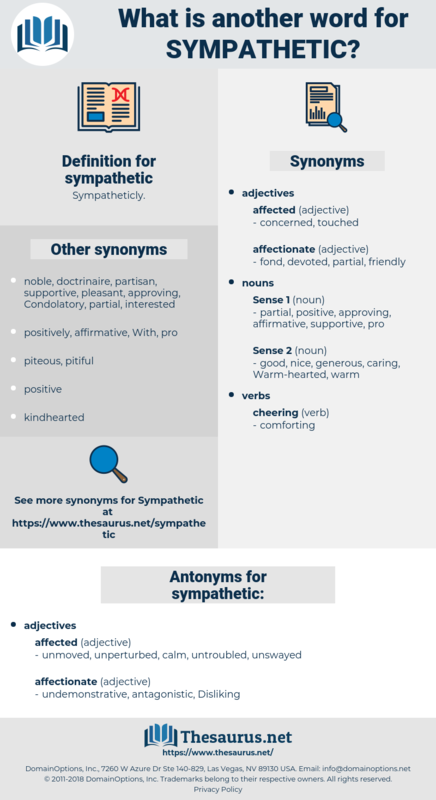 compassionate, likeable, receptive, congenial, sensitive, understanding, supportive, nice, pleasant, appealing, considerate, caring, responsive, benign, agreeable, susceptible, attentive, Solidary, sociable. unmoved, unperturbed, calm, untroubled, unswayed. hurtful, injurious, hateful, unkind, malignant. malevolent, harsh, rough, tough, severe, hard, uncharitable, mean, inhumane. cool, callous, unfeeling, merciless, unfriendly, unconcerned, cold, unsociable. aloof, unthinking, disagreeable, inharmonious, small-minded, brutish, unaffectionate, narrow-minded, indifferent, uninterested, bestial, unloving, unkindly, grim, uncompassionate, unsentimental, hard-bitten, inconsiderate, unrelenting, ungentle, wanton, heavy-handed, abusive, oppressive, thoughtless, stern, ill-tempered, unharmonious, uncaring, dissimilar, coldhearted, pitiless, bigoted. A less sympathetic but finer piece of work is the critical part of Johnson's famous Life.
" I wish you would sit down," she said in a soft, pretty, sympathetic way.